Close to the Syrian regime which it has always viewed as a rampart against the Islamist threat, local church leaders have rarely been so unequivocal. Three patriarchs — two of them Orthodox and the other Catholic — have co-signed a statement strongly condemning the Western air strikes against Syrian government positions while reasserting their support for the Assad regime and its Russian and Iranian allies. In the background, the Russian Orthodox Church is maneuvering to position itself as the defender of the Christian presence in the Middle East. 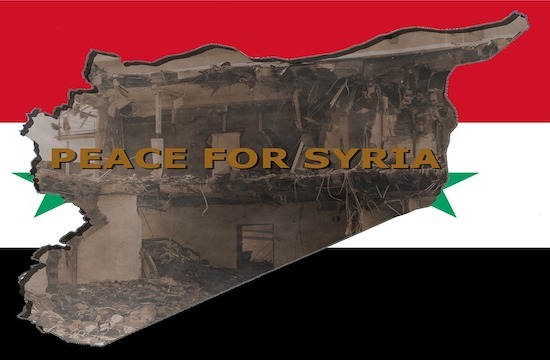 The joint statement issued on April 14 in the hours following the strikes by France, the United Kingdom and the United States in Syria, and published in English on the website of the Syrian Orthodox Patriarchate of Antioch, was an irrevocable condemnation. “We, likewise, commend the brave stand of countries which are friendly to […] Syria and its people,” the communique added. Close to the Syrian regime which it has always viewed as a rampart against the Islamist threat, the Orthodox hierarchy has rarely been so unequivocal in its support for Bashar al-Assad since the start of the conflict in 2011. “It’s not so much the reaction against the Western strikes as the level of solidarity with Bashar that is impressive in this communiqué,” said Cyrille Bret, a lecturer at the Paris Institute of Political Studies (Sciences-Po) and specialist in Russia and the Middle East. Co-signed by a Catholic, this support shown to the Alawite regime has now taken an ecumenical turn. If the fear of massacres and persecution works as a powerful unifying factor for these historically divided communities, it’s hard to say if the Christian communities unanimously support their patriarchs. Supported by Vladimir Putin, Patriarch Kirill of Moscow is also playing the role of defender of the Christian presence in the Middle East. The head of the biggest Orthodox church, who brought together all the Eastern patriarchs in December last, met with Pope Francis on April 14 to discuss the situation in Syria. Implanted in the Middle East since the 19 century, the Russian Orthodox Church has strengthened its presence in Syria in the wake of the Russian army, particularly with dispensaries. At the Angelus in Rome on Sunday April 15, Pope Francis said, for his part, that he was “deeply troubled” by the situation in Syria, where, he noted, it was difficult to agree on joint action in favour of peace.